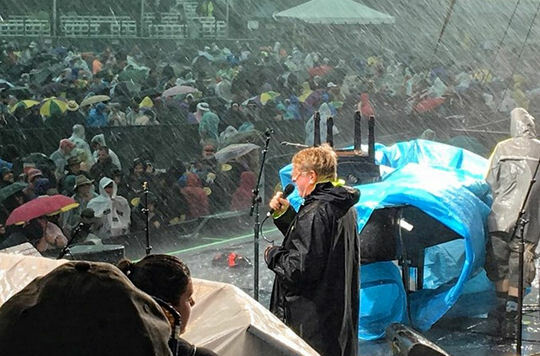 NEW ORLEANS – Rain wreaked havoc on the second weekend of the New Orleans Jazz and Heritage Festival, which led to a drop in overall attendance this year, organizers said Tuesday. Festival organizers said the crowd numbered 425,000 for the entire event, nearly the smallest crowd in five years. It compares to 460,000 fans for 2015 – the highest attendance total since 2005. The large crowds in 2015 (particularly on a day which saw huge crowds for both Elton John and Ed Sheeran, performing on opposite stages at the same time) prompted some safety changes to this year’s event. That included the installation of bleachers near the Acura and Congo Square stages to offer better seating options and prevent crowds from using chairs, blankets and tarps to lay claim to space.